India has witnessed a significant growth in the telecom sector in the last decade with the latest number of cellular service subscribers at more than 900 million. While there is appreciable gap in teledensity 1 in the rural area and overall teledensity of the nation, the gap in broadband penetration is way more appalling. A large contribution to the broadband subscription in India is from DSL or A-DSL services, which require the deployment of optical fiber cables - an expensive proposition. The other options for broadband services include cellular services (such as 3G) or unlicensed Wi-Fi (2.4GHz or 5.8GHz) based solutions. While the former suffers from diminishing average revenue per user (ARPU), high license fees and infrastructure costs, the unlicensed Wi-Fi solutions suffer from poor physical layer propagation characteristics resulting in low-coverage area (≈200m radius) for every base station. The ensuing infrastructure cost is expected to be very high for cellular based as well as Wi-Fi based broadband solutions in the rural areas. One of the major impediments to providing broadband connectivity in rural and even semi-urban areas of many developing countries is the lack of robust cost-effective backhaul. Even in urban areas, one of the major impediments for widespread deployment of WiFi Hotspots is the lack of connectivity to WiFi access points. Fiber connectivity in terms of backhaul is limited in India and may currently reach only at designated points in a town or city. For example, National Optical Fiber Network (NOFN), an ambitious plan of Government of India, promises fiber connectivity only to village administrative unit called Gram Panchayat in the next five years; there are about 2,50,000 Gram Panchayats administering about 6,00,000 village clusters/hamlets in India. This still leaves a big gap in providing connectivity to these hamlets. Moreover, deploying optical fiber at even such scale is challenging due to issues such as right of way. In such a scenario, the problem of connecting the core network to the access network can be addressed using a mesh based last-mile or middle-mile network. 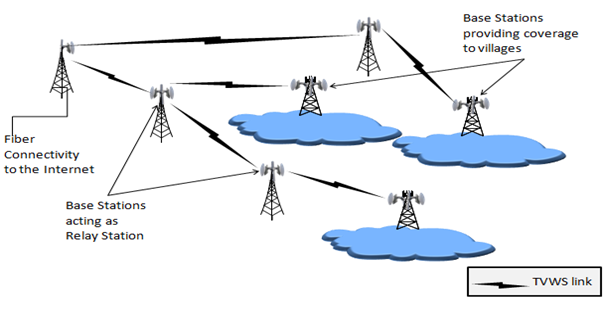 A middle-mile backhaul network is a multi-hop wireless mesh network that is capable of providing coverage within a radius of one to five kilometres to enable seamless connectivity from the access network such as WiFi Zones/Access points/clusters to a optical fiber point of presence (PoP). In order to reach these distances, sub-GHz spectrum provides excellent propagation characteristics, and at the same time will not require expensive infrastructure such as high towers and strict line-of-sight. When analog TV channels switched to digital or when some broadcasters stopped their transmission, spectrum bands became available in various channels at different geographic locations. These spectrum holes are called as white spaces. The amount of white spaces available in countries such as US, UK, and Japan varies depending on the geographical locations. In the US and the UK, regulators (FCC and Ofcom, respectively) have permitted devices to make use of “white spaces” as a “secondary user” without causing interference to the “primary”, i.e., the TV broadcasting on a “license-exempt” basis. Low power license exempt operation on a “secondary basis” has been followed by FCC where the regulators would like to optimally utilize the spectrum which is otherwise utilized fully earlier for analog transmission, but now is part of “white spaces” due to the Digital Dividend. Our quantitative assessment of TV UHF band in India shows that in the 470-590MHz in India, a major portion is unutilized. The results also show that even while using conservative parameters for assessment, in at least 56.27% areas in the country, all the 15 channels (100% of the TV band spectrum) are free. The unutilized UHF band can be used for affordable backhaul. This Fixed Service backhaul can be used for connecting WiFi clusters. It can eventually terminate into urban, sub-urban or village gram panchayat NOFN node. At other places, it can even provide alternative to fiber connectivity (for example, in remote locations, difficult terrain, and scenarios where right of way for fiber is not possible). This can accelerate the deployment of broadband services thus making “Digital India” goals to be achieved faster. 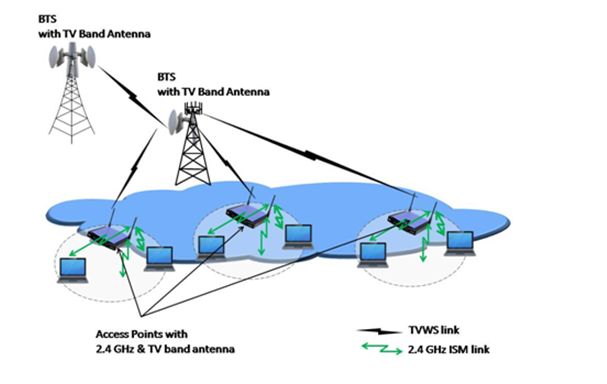 Thus, middle-mile and last-mile network using UHF band system can be developed along with NOFN. In small regions such as a village or Panchayat, 2.4 GHz unlicensed Wi-Fi operation can be used to provide wireless internet coverage. The underutilized TV band spectrum can be used to provide backhaul to these networks and extend broadband connectivity to rural areas. This is a promising application in the Indian context since providing broadband connectivity to the rural areas has been an agenda of the Government since long. If the TV band can be used to this effect, it may turn out to be economically viable. Proposed rural broadband wireless backhaul network is depicted. The blue clouds represent a village which is under coverage by the TV white space base station. The intermediate base stations act as relays. All the relays terminate at a base station with Fiber connectivity. Wi-Fi devices connecting to TV band backhau lis depicted. A dual-band Access point (2.4 GHz and TVWS) facilitites connectivity to the end users. The last mile access technology is Wi-Fi as these devices are readily available at low costs. Multiple Wi-Fi hotspots can be deployed within a village.